Attach a rope to the cable pulley and adjust the pulley so that it is shoulder height. Grasp one end of the rope in each hand and step backward until the rope is pulled taut and your arms and shoulders are stretched forward. Stagger your feet for stability (put one foot in front of the other). Keeping your elbows out to the sides, exhale as you pull the rope towards your shoulders until your elbows travel passed your back. Inhale as you reverse the motion and return the rope to the starting position, with your shoulders stretching forward. 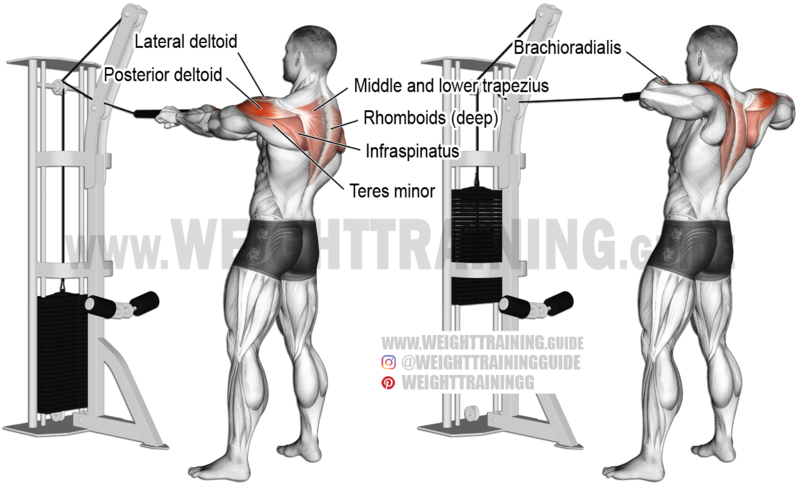 In order to target your posterior deltoids, your elbows and the angle of the cable must be perpendicular to your torso. You can use a high cable or even a low cable provided you adjust the angle of your body so that your elbows and the angle of the cable are perpendicular to your torso. You can hold the rope with the rubber ends either touching your thumbs or your little fingers. Do not confuse the standing cable rear delt row with the cable face pull. Isn’t this the face pull? No, I describe the face pull here. very imformative, thanks for sharing your knowledge.